Public transportation in the Lake Geneva area is excellent with a major international airport (GVA), boats, trains, and buses. Driving is pleasant too. Getting around in the Lake Geneva region is very easy with excellent public transportation on the northern side of the lake where many towns have train stations or bus services. Pleasure cruises and passenger ferry boats ply many routes on Lake Geneva. Geneva International Airport (GVA) is conveniently located and offers flights to many parts of the world. Driving is a great option too although parking is problematic in Geneva and Lausanne. Boats, mostly operated by CGN, cruise on all parts of Lake Geneva both for leisure and public transportation purposes. Pleasure boats cruise on Lac Léman as a pleasant, if slow method of traveling in the region. The number of departures is much higher in summer than during the shoulder season and in winter usually limited to weekends and special dinner cruises only. Ferry boats operate year round on Lake Geneva to mostly connect French and Swiss towns. Passenger ferries connect Lausanne and Évian, Lausanne and Thonon-des-Bains, and Yvoire and Nyon. No car ferries operate on Lake Geneva. In Genève, small Mouette boats cross the lake as public transportation alternatives to buses and trams. Geneva Airport (GVA) straddles the Swiss-French frontier at Cointrin on the edge of Geneva city. Flights, including cheap flights on low-cost carrier EasyJet, are available from Geneva to most parts of Europe and to a few intercontinental destinations, including New York. Geneva Airport is very conveniently located. Long-distance trains depart from the basement of the airport and bus services are available to downtown Geneva and several cities in France too. Geneva Airport has direct access to the highway (Autoroute A1) allowing for fast traveling times to many part of Switzerland and neighboring France. Public transportation on the more populous northern bank of Lake Geneva is very well developed. Trains run from Geneva to Villeneuve and are generally the easiest way to travel. Many small towns have train stations with bus services to towns without rail links. Geneva and Lausanne are the two main railway hubs in the region – it may be necessary to transfer here to slower regional trains to reach small towns. Both Genève and Lausanne have high-speed TGV Lyria train links to Paris, while further TGV trains go from Genève to the south of France. Public transportation on the southern shores of Lac Léman is less convenient for tourists. 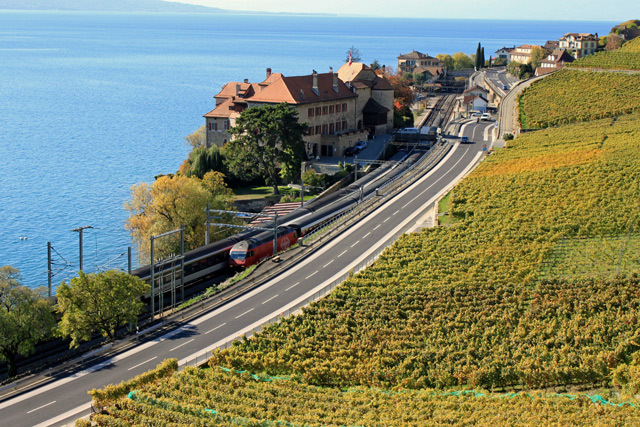 It is often easier to use the Swiss trains on the northern shores and cross Lake Geneva by passenger ferry boat rather than to use road or rail transportation on the French side of the border. Check public transportation timetables and buy the cheapest train tickets online from Swiss Railways. Driving in the Lake Geneva region is quite pleasurable with well-maintained and generally not crowded roads. Traffic cameras are widely employed both on the highways and in towns. Highways run along most of the northern shore of Lake Geneva. The Autoroute A1 from Geneva to Lausanne gives occasional glimpses of the lake but better views can be enjoyed from the A9 from Lausanne to Villeneuve. The lakeside road is much slower but gives better views of the lake and the small towns. The views in the Lavaux area between Lausanne and Vevey are particularly good. French National Route N5 runs along the southern bank of Lac Léman. The lake views are particularly good from the Swiss-French border at St Gingdolf to Évian-des-Bains. The centers of Genève and Lausanne are best explored on foot. Driving here is difficult and parking expensive and hard to come by. Parking in smaller towns is generally available and often free but park only in designated parking spots. Cycling is also a great option in the Lake Geneva region with easy flat routes running next to the lake or more challenging routes going into the hills and mountains. Cycling around Lake Geneva is possible on a well-signposted route.